It’s difficult for a landlord to be tough on tenant crime unless their lease is as well. Reserve the right in the lease to approve any new occupants, and if possible require new occupants to undergo a tenant background check. Additionally, it may be best to add the new occupant to the lease, so all rights and responsibilities of the tenancy apply to the new resident. Include provisions that hold the tenant accountable for their guests’ actions and any damage a guest may cause, so the tenant will be careful who they bring into the rental property. Refer to a schedule in the lease for routine property inspections, so tenants considering criminal activity may reconsider. Demand that the tenant promise to avoid criminal activities, subject to eviction. Where possible, avoid language requiring that the tenant be convicted of a crime before they can be evicted. Consider language that provides a tenant can be evicted if they made false statements on the rental application. Because laws vary from area to area, it is always a good idea to speak with your legal counsel first before you make changes to a lease agreement. The Crime Free Multi-Housing Program provides a turnkey crime free lease addendum. Consider participating in a local Crime Free Multi-Housing Program. Check with your local landlord association or police department for availability in your area. Display the Crime Free Certification in your leasing office, refer to it in rental ads, on business cards or in your leasing packet. The earlier a bad applicant sees that you are tough on crime, the more likely they will avoid the property. 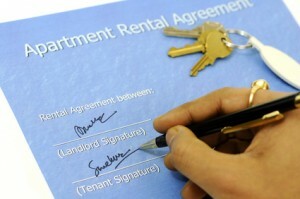 Indicate in your rental ads that you conduct tenant background checks. Problem tenants tend to target landlords who do not screen applicants thoroughly. Maintain the security features of your property, especially what can be seen from the curb. Let applicants know you put your money where your mouth is when it come to protecting the property from crime.